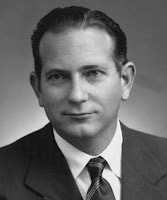 News of Jack Vance's passing, a few days delayed, is now hitting the old-school gaming sphere. Although I could wax in already-waxed ways about his fantasy, his science fiction, or for the n-teenth time about the vision of magic in his Dying Earth novels, there's a less obvious way his fiction has influenced the world of my campaign games. 1. The community projects a fraudulent myth to outsiders and visitors. 2. The myth is shrouded in some obscure custom or activity. 3. The custom or activity is presented as advantageous to outsiders. 4. This is not the case; a situation of exploitation obtains, in which outsiders are easily ensnared. Vanceburgs from the Dying Earth novels are legion, but include the gruesome ponzi scheme of the rat-men; the town of Vull, where Cugel is set on watch for Magnatz; and Master Twango's scale mining operation. The Planet of Adventure series arguably describes a series of Vanceburgs, from society-scale to the intimate scam of the eel-race at the end of Chasch. In Lyonesse, one is reminded of fish dishes sold at a "seasonal price." In my own game, the memorable Vanceburg was the far northern town of Parmentell, peopled by bluff merchant factors and evasive townsfolk, and dominated by a secretive citadel. The authorities' constant fees, levies, regulations and imprecations lent a Vancian air to the proceedings. The town billed itself as a prime base for adventuring parties to hunt the secret stores of purple worm ivory and even the Purple Worm Graveyard itself, scattering maps throughout the realms. In reality, few adventuring parties found any ivory, but their activities concealed the actual source of the town's wealth, for the Graveyard itself lay underneath the citadel. The mysterious ceremonies were actually farewells to desperate citizens daring to descend to this vast cavern, which promised unimaginable wealth but also speedy death at the hands of lesser worm guardians and worse. Thus, a double-tiered Burg, with the townsfolk persuaded that their knowledge of the truth and chance at upward mobility gave them an advantage over the visiting rubes. While the Vanceburg is at high risk of being overturned in one way or another by its perceptive visitors - and my campaign was no exception - I should also mention an inversion-variation on the theme that sometimes pops up in the Vance corpus. In this concept, the inhabitants of a place have themselves become deluded by their own myth, and so ripe for upending, exploitation, or outright robbery by the canny interloper. 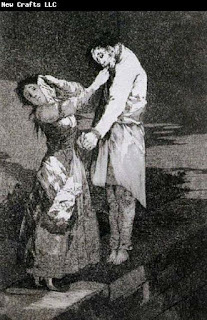 Shining examples are the villagers of Smolod who lived in the paradise granted them by the cusps of the Overlord, or the pilgrims of Gilfig on whom Cugel practiced a memorable deception. The Burgvance, perhaps? Although I've shied away from this kind of adventure plot because it seems too easy, I'm sure it could be put to work, with the primary risk being the awakening of the inhabitants themselves ... Perhaps this is a good way to tone down the threat of monsters stronger than the party can defeat toe to toe. Imagine a society of hallucinating minotaurs, or a revival tent meeting of altruistically deluded mind flayers? 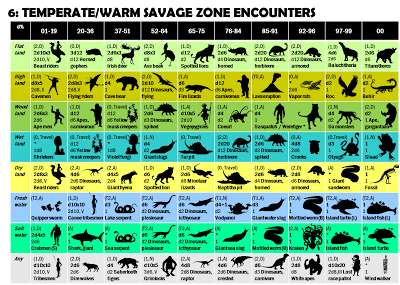 Recently, a comment from Jack Headland reminded me that I hadn't ever posted the table for "savage" encounters from my encounter series, though I did show the silhouettes and make some kind of rambling nostalgic semi-related post about dinosaurs. 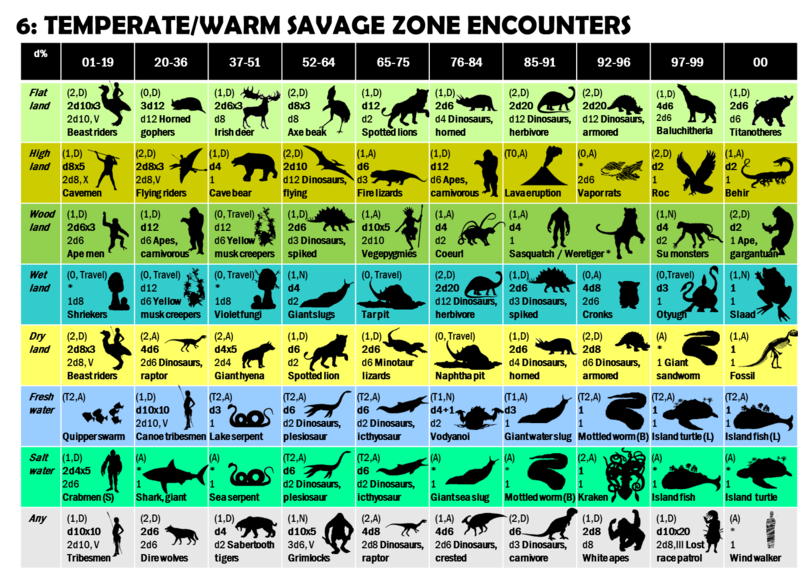 This table is just for every kind of prehistoric beast and other outlandish creature you might find in a lost world or very hairy wilderness. Others in series can be found in this tag. I've gone to percentiles along the top because they're more accessible and also fit well with the percentile system I've adopted to tell you which chart and row to use in the first place. Maybe I'll share that one later this week. 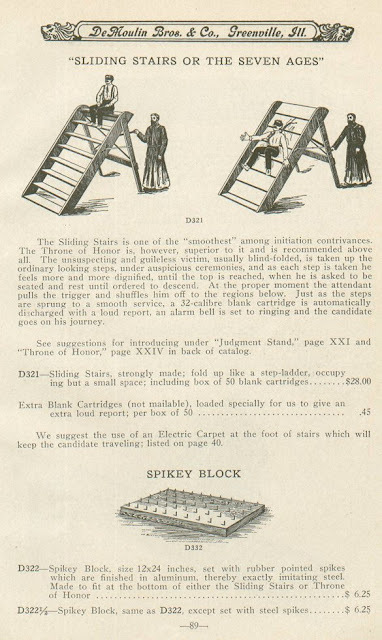 Two separate sources this weekend led me to the amazing and disturbing Demoulin Brothers catalog of initiatory prank equipment for North American fraternal lodges, published in 1930. 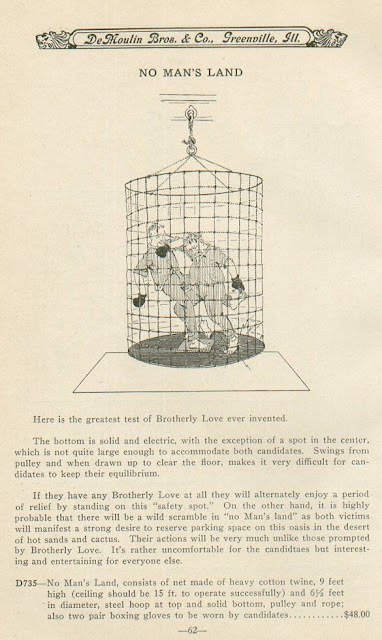 These lodges - the likes of the Elks, Moose, Woodmen, Odd Fellows, Red Men, and avowedly unserious outfits like the Hoo Hoo and E Clampus Vitus - outdid each other in prankish initiation rites, aided and abetted by the electric shock gadgetry and "burlesque costumes" of the Demoulin Brothers. Having already remarked the similarities between the levels and titles of Dungeons and Dragons, and those of a fraternal order, I can't help but wonder if the spirit of the basement initiation rite also lives on in the tricks and traps of the "gotcha!" dungeon. In the DeMoulin catalogue, as with the Dungeon Master's catalogue, nothing is certain, safe things are dangerous and dangerous things safe. 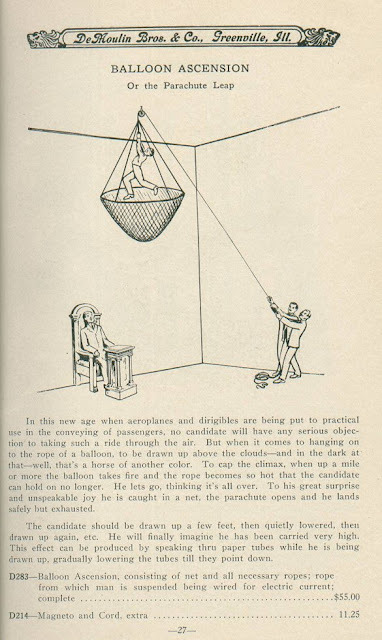 Even the famous imperceptibly sloping corridor of Greyhawk Castle has its precedent in the "balloon ride" gag shown below, visibly hoisted and imperceptibly let down. In most adventure design methods I have seen, treasure placement is kind of an afterthought. The perils and creatures come first, and then the treasure is placed more or less methodically according to what is guarding it. Or, you place your dangers and then you ration out how much treasure the level will contain, in dribs and drabs here and there, with an all-important number in mind ... let's say, 5 party members at 2000 xp each to get to second level ... yup, clearing this dungeon level should get them there. Now, if the party never catch on to the idea that their treasure is being handed out like a paycheck, that's fine. But as a DM I like to be surprised by my own creations. Rolling things randomly while stocking an adventure site is a big part of that. The random comes first, the sense comes after, and more often than not the gain to be had in creativity is immense. The idea with this treasure table is: each trove is its own thing. It could be a pittance, or a bank-breaking amount. There is an upper limit on each trove, because you want some control over huge hauls, but in my system it's a pretty big upper limit (characters need only 1000 xp to make 2nd level, so two maximum level hauls - you stop rolling once you hit or exceed 2000 x current "depth," or dungeon level - will get them most or all of the way there. However, the average value of hauls at depth 1 is about 500, so the average party will level from about 10 of them, or if there are other ways to get experience that are roughly balanced with treasure, about 5. And not all treasure will leave the dungeon. Some of it will be unwieldy, requiring a laborious extraction. The matrix of value vs. weight pretty much sees to that (200 weight of fine quality wood anyone?) Some of it will be hidden or just never found. 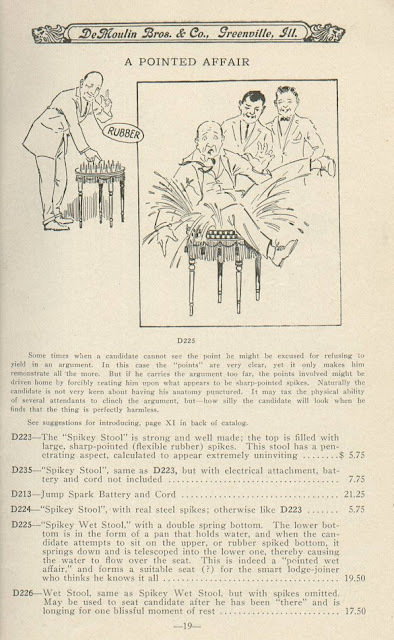 Coins, in this table, are not all that common, so transporting and selling the treasure will be the norm. The more variables there are, the more adventure feels like adventure, and less like drawing a paycheck. If you are trying to create a sense of wonder, danger and adventure in your players, while you yourself know that you have scripted out the adventures with carefully level-balanced encounters and rewards ... while you may entertain the players, something will be lacking for yourself. Having rolled, and possibly surprised yourself, why not then build the adventure around the treasure, instead of the treasure around the adventure? Create the hazards and monsters more or less proportional to each trove, with some having no treasure at all but guarding key points - in effect, giving access to later treasures. I'll give an example, next post. Reign of Wizardry: Unacknowledged Gygax Source? 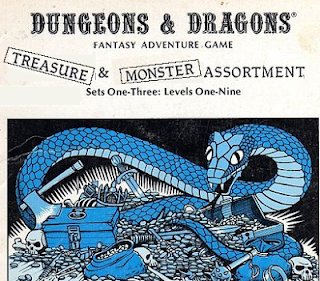 which Gary Gygax lists literary influences on the game. One of the writers who appears without any specific works listed is Jack Williamson. 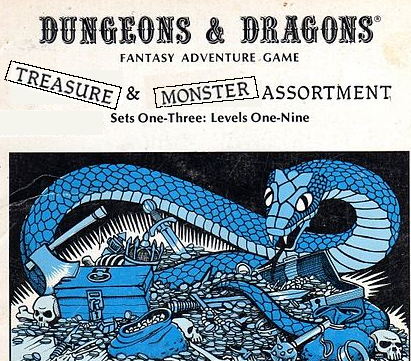 I don't think anyone yet has realized that Williamson may well be the direct source for a few aspects of magic, monsters and adventures in AD&D. Williamson is one of those science fiction writers I read as an adolescent without really absorbing his name. His career started in the 1920's and his last novel, a year before he died at age 98, was published in 2005. Along the way, he is credited for inventing such terms as "terraforming," "genetic engineering," and "Prime Directive" - the latter from his classic 1947 story "With Folded Hands," a wry subversion of the ideals in Asimov's contemporaneous Robot stories. It's been assumed that Gygax's reference to Williamson's influence is indirect, and based on those science fiction works. Having just read Williamson's 1940 novel Reign of Wizardry, I'm not so sure of that. There are a number of telling resonances with the very specific elements of early D&D in this "sword, sandal and sorcery" novel of the ancient Greek world. The version that Gygax probably read was the 1964 Lancer paperback reissue. Superficially, the setting resembles previous examples of the ancient-world pulp story such as Talbot Mundy's "Tros of Samothrace" series: a fantasy Theseus pursues a grudge against the sorcerous rulers of Minoan Crete. The writing is zesty, evocative and gritty. Williamson uses the well-known Greek myth as a springboard rather than crutch for the plot, which delivers more dizzying twists than Christopher Nolan or M. Night Shyamalan would dare try. What about the D&D influence? I'll go from most obvious to most doubtful. 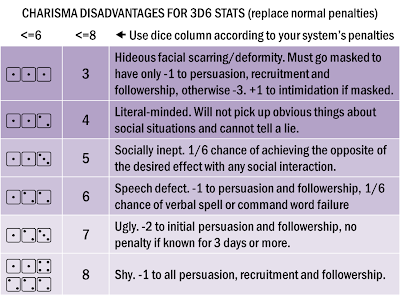 AD&D spellcasting: As Gygax's Advanced game increased the power of spellcasters with a plethora of new spells, it also limited them with increasingly specific rules on how spells were cast. One of the key elements: the detailing of verbal, somatic and material components, with terminology taken straight from Pratt and de Camp's Compleat Enchanter series. 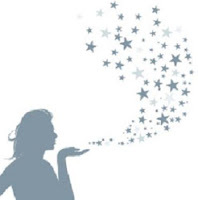 But in that series, all three were described as necessary components of spellcasting; while in the Player's Handbook, many spells lack one or more of the elements, complicating the question of whether a spell can be cast while bound or gagged. 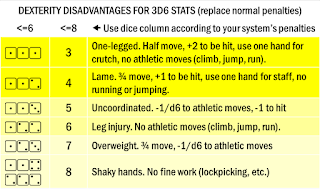 Where did Gygax get the idea to make the components optional for different spells? As it turns out, Snish can indeed cast his spells without verbal component, although this fact turns out very much to the admiral's disadvantage. I can't help but infer that the question came to Gygax's mind as a result of this scenario, or similar other ones in fantasy literature. Iron golem: The iron golem in the Greyhawk supplement and AD&D has a number of abilities - slowing spell, poison gas cloud - without obvious precedent in fiction or legend. In Deities and Demigods, the Cretan construct Talos is described as a "triple iron golem." Reign of Wizardry has a memorable version of Talos as a giant, moving brass statue who is animated by an internal magical fire and causes steam when he wades in the sea. This aspect is probably inspired by the legend, in the classical Argonautica, that Talos would heat himself in a fire to give intruders a lethal embrace. But the internal sorcerous fire of Williamson's Talos seems to have inspired at least one trait of that D&D golem - being regenerated instead of harmed by fire damage. Perhaps the other abilities have an equally obscure fictional origin? Specific spells: The sorcerers of Crete, including King Minos himself, hurl lightning bolts, while a very crucial spell known to the wizard Snish (and, it turns out, others) bears a distinct resemblance to the AD&D illusionist spell, change self, although the version in the novel lasts until you make close contact with another person and can be conferred on others. Theseus left the remains and went on down, wondering what might be on the fourth landing. Again, he counted fifty-eight steps. But, where the fifty-ninth had been, there was -- nothing. Almost, moving with too great confidence, he had lost his balance. The way through the dwelling of the Dark One was clearly thick-set with peril. The most of those thrust into the labyrinth, he thought, must perish in this chasm he has passed. I'm reminded of this anecdote from Mike Mornard of a convention scenario run by Gygax, in which eight out of nine incautious would-be adventuring parties fell victim to a similar death pit in a stairway, concealed by a wall of darkness. While the direct connection can't be proved, the indirect one is evident. The kind of fiction Gygax read and enjoyed was directly reflected in the challenges he set for his players and the style of play that ended up being rewarded. While researching my folk saints I came across a most intriguing real-world figure, the legendary, uncanonized Santo Amaro. This blessed wanderer set sail from the land of Alia, "whose cities now lie in ruins," searching for the terrestrial Paradise, convinced it lay across the oceans - he is assumed to have sailed west, although the direction of travel is not always clear from the manuscripts. He gathered a crew (could YOUR PARTY be that crew?) and set forth into uncharted waters, guided only by faith. The Spanish texts of his adventures (available here, at the end of the monograph) bear a certain resemblance to themes in pagan Celtic literature of the journey across the western ocean to the Otherworld (imramm) and to the similar legend of St. Brendan the Navigator from Irish Christendom. C.S. Lewis (who was Northern Irish) may indeed have drawn on these tales of curious islands, moral lessons and marine perils for his Narnia book, The Voyage of the Dawn Treader. Amaro's encounters, to the gaming mind, look like the kernel of a saltcrawl map. 1. Tierra Desierta, island of five cities and many castles, where the men are ugly and the women beautiful. Abundant animal encounters. Provisioning and trade available. Handsome male party members are at risk of entanglements, jealousy. 2. The Ruddy, or Vermilion Sea. 3. Fuente Clara, island of many sins and vices, but where everyone is beautiful and courteous, disease is unknown and the lifespan is 300 years. Henchmen and hirelings must make a loyalty check or remain in this false paradise. 5. Ysla Desierta, bare of growth, overrun by fierce lions and populated by hermits, a fortified abbey with basic supplies. Each Saint John's Day the lions and other fierce beasts fight and the stench of the resulting corpses is such that anyone staying on the island for up to a month afterward is sickened. 6. Further on the monastery Val de Flores, in an abundant land with rich supplies. The leader of Val de Flores is a friar, Leonatis, whom the local savage lions respect. 7. The Port of Three Houses, a rich and beautiful land but without inhabitants and the port with no more than three houses. 8. The two hermits in the valley beyond do not know where the Earthly Paradise is, nor do the high-born women of the convent Flor de Dueñas. but the wandering holy woman Baralides does, who only appears to the virtuous. She can give directions to the gem-encrusted castle gates of Paradise. Amaro's voyage is short, however, compared to the wilder adventures of St. Brendan, which curiously manage to cover some of the same ground. Maybe a Greater Neo-Imramm Western Sea map is in the offing? 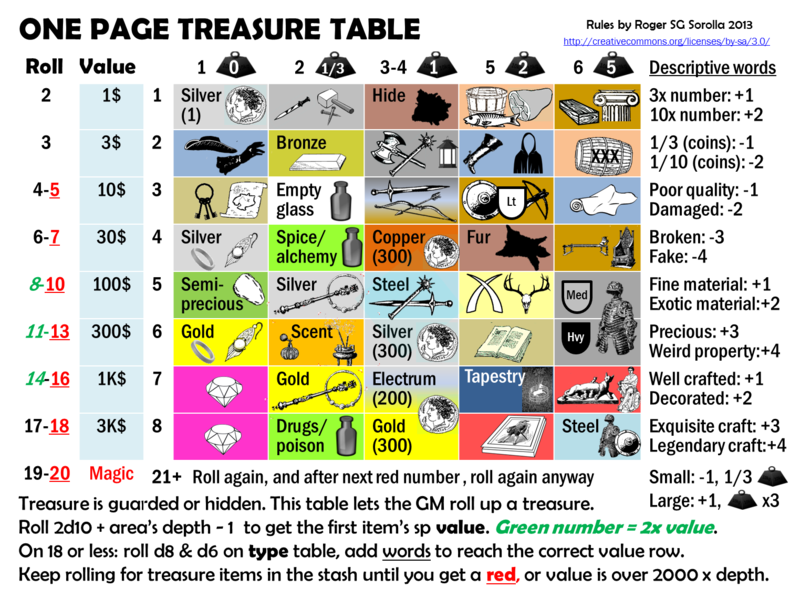 Well, finally I have completed the treasure table for the One Page Rules. This is actually more like Take 3, as I went through several less worthy and less graphically intensive alternatives that just didn't look right. And it took a long time to grab up all these public domain images. I'm just going to leave this out there and see what people think. I should explain that previously in the rules, item weights are represented by weight icons (approximately 5 lb though adjusted by unwieldiness); armor types by the schematic shield icons; low-level partial +1 weapons and armor are made of various kinds of steel; and "depth" is my term that approximates "dungeon level/challenge level." Anything you don't understand? Could be better? 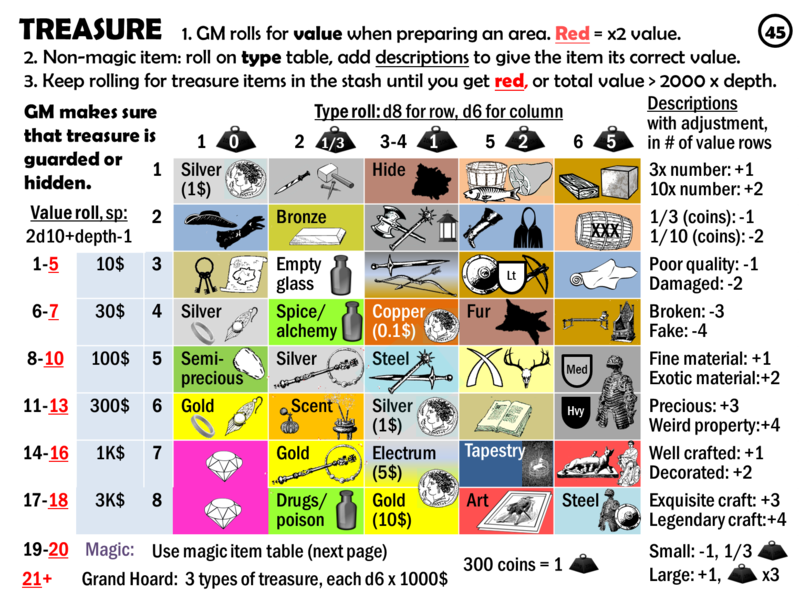 I will say that, played by my rules, it does a pretty good job at generating varied amounts and contents of treasure hoards, with a decided bias away from coins and the occasional hard-to-transport white elephant. All right, let's finish this series off. 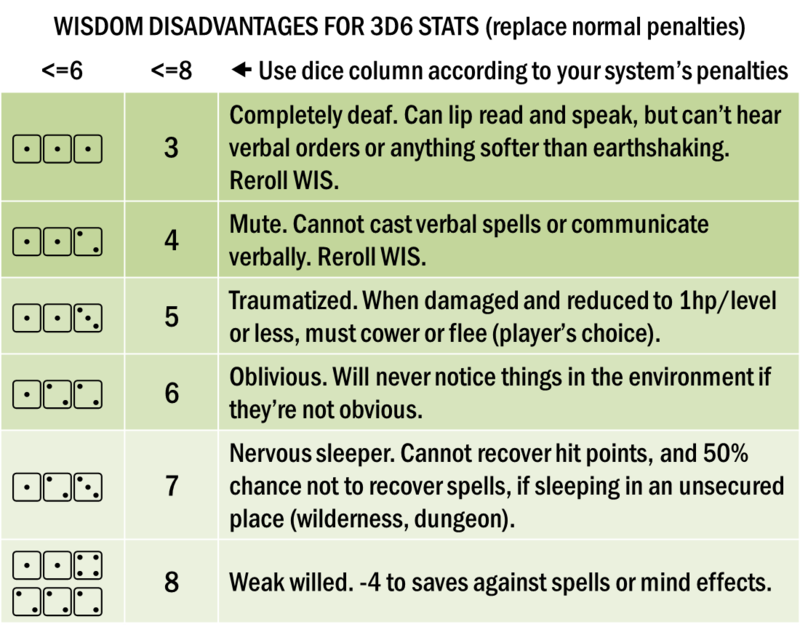 I may not use these rules in the game I'm running right now, but it would come in handy if I run another campaign with more bells and whistles attached. Any interest in a pdf of all of these? There's a player in my campaign whose signature corpse-looting move is to cut open the belly of any large creature, in search of treasure. I gave it a 1 in 6 chance to succeed the first time, with a giant toad, then a chance for the object found to be valuable, and he got lucky, so he never passes up the opportunity now. Anyway, I thought this would be a good opportunity for a table. Use the table only if creature is human size or larger. Add any hit dice above 1 to roll, if hit dice are proportional to size. One of the main things encouraging corpse-looting in D&D is the unquestionable fact that troop-type monsters - orcs, goblins, the occasional bandit - each carry a small personal stash of low-value coins, something to tide you over while you're looking for the main lair. But what's behind this assumption? Superficially, it seems silly that a horde of goblins or gnolls out on a raid would value coins at all. After all, what would they spend it on? No human town would trade with them. Desperate raiders just look to get by, day to day. They'd be much more likely to loot ornaments, clothes, weapons and armor, supplementing their own lack of crafts, and of course they'd value food, drink, slaves, livestock and edible corpses. But going around with a pocket full of pennies like some kid on the way to the grocery store? 1. Between raids, humanoids are bored stiff. They have few stories, jokes or songs, so gambling is their main vice. They find human coins useful tokens; prestige is had by accumulating the most of these, but individual humanoids don't like to go weighed down, so really big winners often throw their piles of coins up in the air, giving them even more prestige. Hobgoblins, it's said, have developed the standard variety of crude dice games into a kind of wargame using bone pieces, with which they hone their strategic thinking. Kobolds favor a game with elaborate rules that the non-kobold mind finds hard to pick up. Goblins play a dumbed-down version of the kobold game. Orcs, gnolls, ogres and so on play a game called "same or different" using knucklebones, or dice that have only one or two spots on each side. 2. Individual humanoids don't find coins useful, but their leaders do. Individuals only carry coins when the whole tribe is on the move, to lighten their load. A tribe-level economics of brute force prevails beyond the pale of civilization. To save face and lives, confrontations that would likely end with both sides weakened are decided instead by a contest of dominance, and an offering of coin from the weaker group to the stronger. 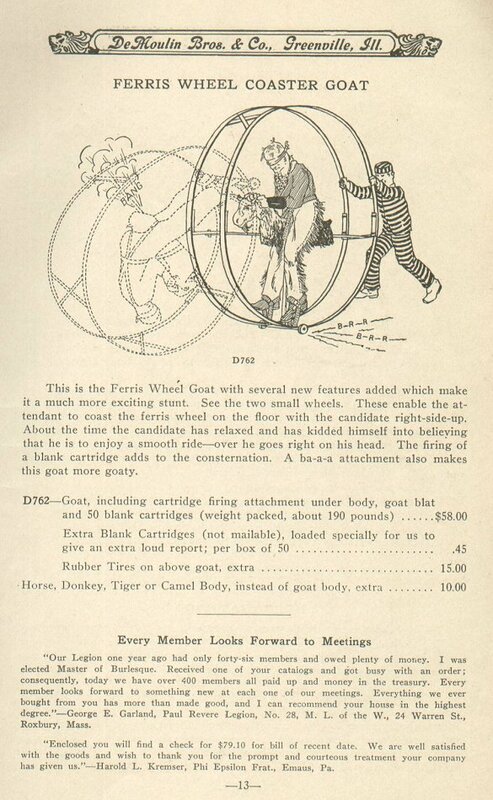 The weaker group sends an expendable member hauling the coins to a distant place, where the stronger group goes to collect and claim victory over the one unfortunate, while the main body of the weaker group makes an orderly retreat. Humanoids have found that humans also respond to extortion or tribute, and savvy adventurers know what to say and do to set this kind of negotiation in motion. The first of a few observations about the classic victory cry of the adventurer. Looting the bleeding, crushed, burned and hacked bodies of dead foes is, for many adventure gamers, just a boring, routine conclusion to a scary fight, usually rewarded with a few coppers or a single low-value trinket. You know the real important loot is probably back in the lair, sitting on a trap or locked up tight. 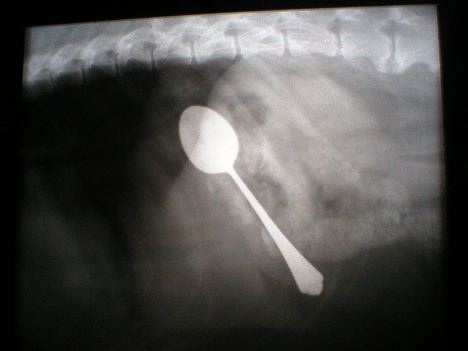 Where's the moral horror that this act should raise in sensitive minds? Well, if there's no horror in robbing the imaginary dead, there may be disgust if corpse-searching exposes yourself to their fleas and lice. And if the vermin bring a play disadvantage, you're sure to see more wariness and a little more respect for the poor old stiffs. Per verminous body looted, there is a 1/3 chance of contracting the body's insects. An infestation makes it 1/3 probable each night that sleep is disturbed, meaning you recover 1 less hit point or can't memorize your highest level of spell. A good bath in town with proper scrubbing and hair-picking (cost: 1$) will remove the infestation. If you've got a boyfriend or girlfriend, they'll do it for free. Usually. So, here's how the commonly-seen thief/rogue ability of picking pockets can finally come in useful without getting into trouble with the law or worse, robbing fellow party members. Simply put, the pickpocket can use the skill to loot a body without the risk of contracting vermin. Pedicular pests can also be a risk of low-quality inns, and make certain gross and hairy monsters even scarier after death. 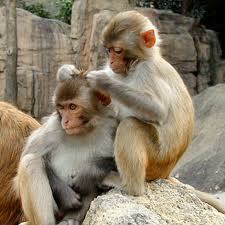 "Y'ever see what happens to a feller gets bit by some a' dem bugbear lice? 'Taint a purty sight..." says the old one-armed man at the tavern. Actually, the changing content of Murphy's Rules over the decades is telling. 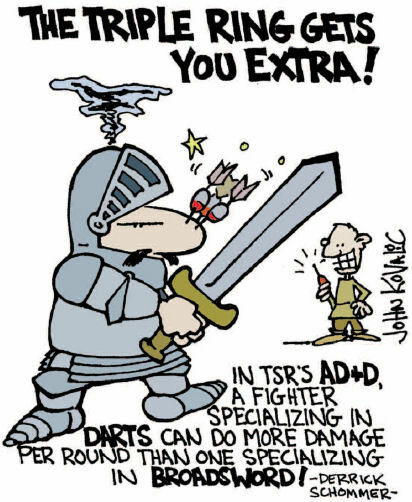 In the 90's, there were plenty of yucks to be had from the crude, often clueless assumptions of older D&D rules - the 1 1/2 ounce gold piece, darts doing more average damage per round than a sword, and so on. This mockery led to the "solution": Wizards of the Coast D&D, torn down and rebuilt from the ground up to be realistic and systematic. Monsters playing by the same rules as characters. Universal systems for fighting, breaking, building, crafting, moving and persuading. An end to Murphy's Rules, right? To be fair, every edition of D&D has contained a way out for the DM, a big red fiat button to push if the rules corner you into an absurd judgment. But the more rules there are, the more authority the rulebook seems to usurp. The best way to tell people not to apply a rule stupidly is not to write it down in the first place. I'm not sure where the tipping point is between accepting common-sense rulings and relying on the flawed totality of the rulebooks, but a critical point has to be when you extend the adventure game rules system beyond "exceptional actions in a limited scope." In its overgrasp to rule over every aspect of existence ... to make your walk to the store to buy eggs a DC5 skill check ... to give a Constitution score to a horse and a Size class to a mountain ... the totalizing rule system sets itself up for humiliation, exploitation and failure. Mocking the rule that states the obvious is a bracing smack to the kind of player who looks to exploit the rules precisely because they have no rule that states the obvious. Or to put it another way: if the rules protect you from the arbitrary whims of the hypothetical unfair, callous DM who must haunt designers' nightmares ... who protects you from the rules? These disadvantages are both more straightforward than the others, and more harsh. Dexterity is a pretty important thing not to fall short on, if you're an adventurer. 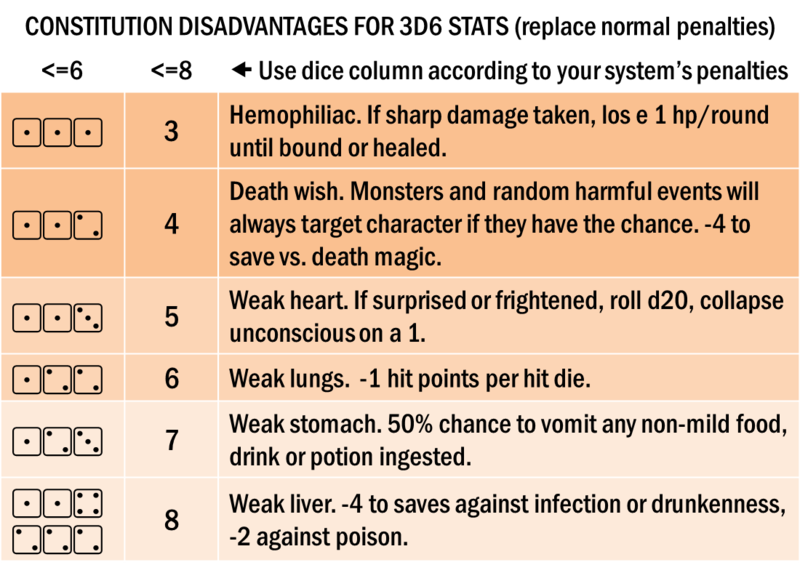 With a 3 or 4 disadvantage here - or even a leg injury - there's pretty much no running away and you should invest in some potions that let you flee or hide. Regeneration or healing will be pretty much on the "must do" agenda. 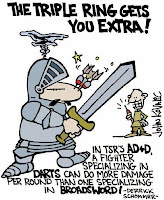 Really, for advantages, Dexterity should also be a bigger thing than it is in D&D, helping you dodge, move, hit in melee and missile, and just about everything else coordinated. 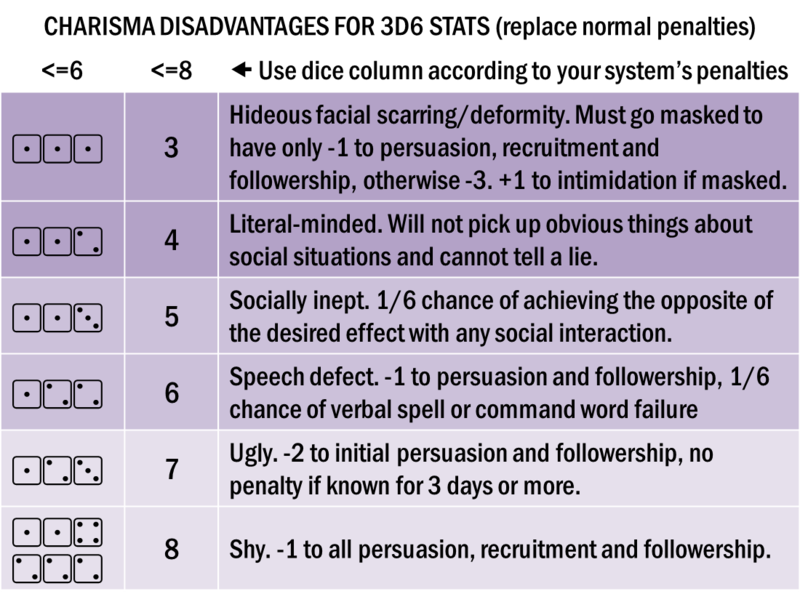 I'm committed to the six stat framework but for simulation purposes I think nothing beats TFT/GURPS and its STR/DEX/IQ, seasoned with special advantages to simulate things like Charisma. I'm stuck at a point in the 52 Pages houserules where I'm confronting two tasks that seem unpleasant. Remember, the One Page Rules idea is about being simple, elegant, or at least enough for each chunk to fit on a Powerpoint slide using 18 point font. I'm coming up against two tasks where I really would prefer to do things differently in actual play, so it's hard to honor the spirit of the 52. One is my beloved carousing table. I want to fit a whole set of rules onto about 40% of a page. But it seems just too violent to chop down the many odd occurrences to a set of generic outcomes. The other is the treasure page. 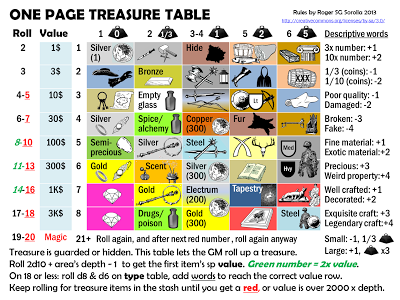 Yes, I have an idea for a really super-simple approach to treasure that goes very well with the 52 Pages aesthetics, but again, I would prefer rolling up treasure on a big ornate multiple d100 table where I can get marten fur capes or octagon-cut chrysoprases or Dust of Sneezing and Choking. See, there are three ways you can handle game mechanics. 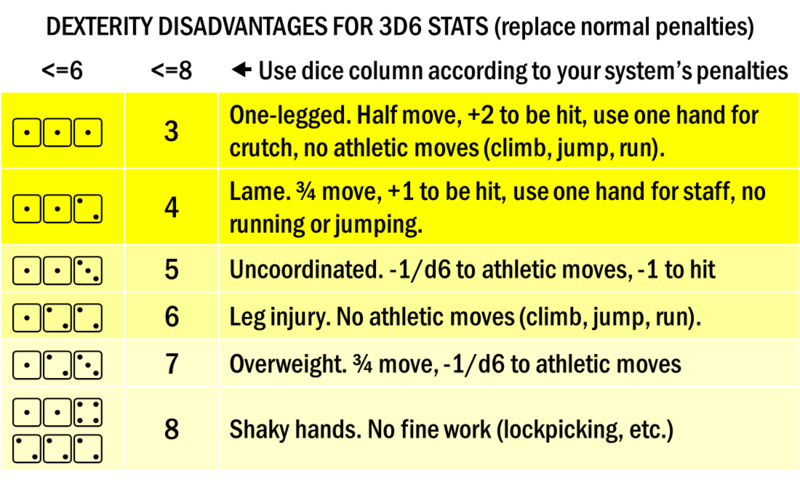 You can go Simple, where combat is: each side rolls d6, add modifiers, higher side wins. 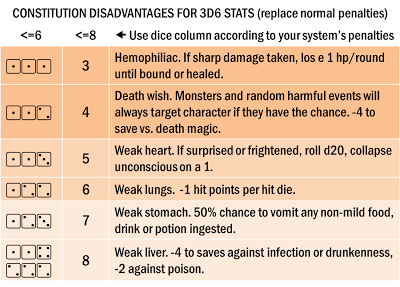 You can go Detailed, where combat means, each side rolls on a d100 table with modifiers and gets a result of what you do to someone else or what someone else does to you. (that would actually be pretty cool - an all-critical-hits approach to combat). 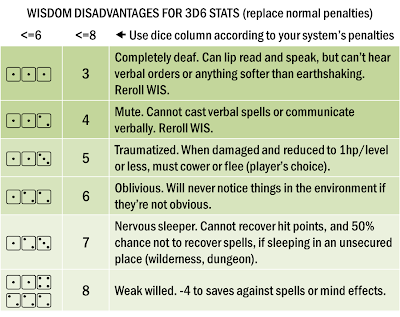 Or you can do what most systems do and go Procedural, where there are complicated interactive rules that give the players the feeling they're making decisions. Each aesthetic also has a standard. The Simple should be really simple - easy access, basic results. It should involve as few rolls, lookups, and choices as possible. The Detailed should be really detailed - easy access, complex results. Each table should really brim with spirit, options and creativity. The Procedural should, by that standard, make the players using it feel like they are making real choices, or should make the GM using it feel like the world is making real choices. Difficult access, but complex, interactive and realistic results. This map also lets us identify a no-man's land, where a procedure is complicated and at the same time estranges players from the feeling of choice. The pinnacle of this: the unplayable hyper-realistic kind of system that has flourished throughout the history of role-playing, where your hit on an opponent unleashes all kinds of weapon shear and armor abrasion and bone fragmentation, but ultimately it's all as boring as watching a pachinko ball cascade down. By the same token, offering too many options can also rob the players of the feeling of choice, as they thrash blindly about in the long period before they gain "system mastery." How would this apply to treasure rules? 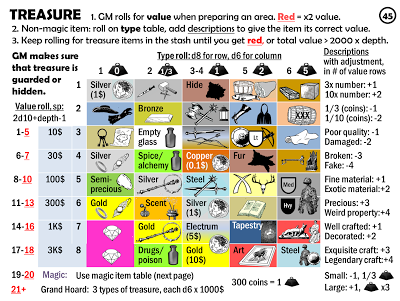 The Simple would just dictate a random amount of treasure value by level, and what general form it is in. The Detailed would be a d100 x d100 table with all kinds of rare goods and magic items in there. By this standard, the 52 Pages is about half simple and half procedural. And yes, as you'll see soon, that also applies to the treasure rules I'm working on. 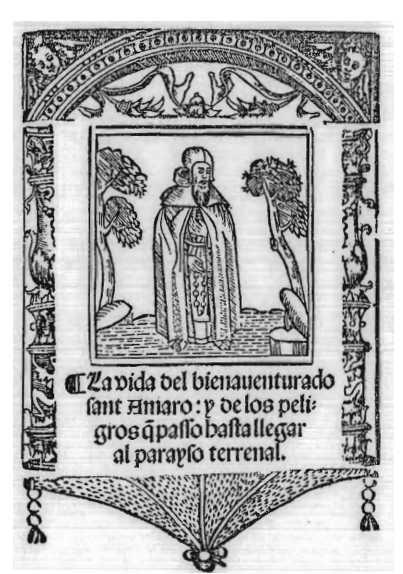 I'm pretty sure that when I finish the 52, the return of the repressed is going to compel me into blurting forth something really Detailed, like Pergamino Barocco. 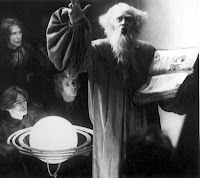 As a way to combat the whole prosaic yawn of "any neighborhood padre has the magic healing hands" in fantasy gaming, I wrote some time ago about the concept of the prophet class. Within any given priesthood only a few individuals are gifted with the vision necessary to perform true miracles. Often, they wash out of the hierarchy because of the uncomfortable truths they speak, and become controversial vagrants. Sometimes, they minister to a band of equally outcast rambling adventurers. So, as I consider how wizards and the like might fit into my world (we've avoided this so far because there have been no wizard PCs in the main campaign), why not take up a similar idea? I mean, if there are as many wizards as fighters ... if there are even one tenth or one hundredth as many wizards as fighters ... you are pretty much into the awful awful 2nd edition "let's think this through" world of unseen servant rickshaws with the continual light headlamps and every ship of the line has a Master Magician to cast fireballs and gust of wind. "This will be on the quiz." But what would the substrate for the rare and oddball magic-users be; what would they rise out of, in the same way prophets arise from, or sometimes despite, the Church? Bingo ... academia. Write what you know. Forget the wizarding academy, all the real action is in the mundane university, with gremlins and homunculi peeking through the ivy. The holy lands of the Inviolacy have attracted and encouraged a roster of religious eccentrics. Abandoning comfort and hygiene, they dispense wisdom from sylvan retreats. Here are three of the most notable. Renouncing his name, this venerable fellow set to climb the most secluded oak in the park of the bustling city of Schiecchi. 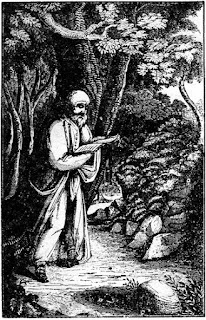 He has been there so many years that he could not leave if he wanted, because his beard has become entangled in the leaves and branches of the tree; his garment is simply this self-same beard, augmented by dead leaves and acorns. Birds and squirrels bring his meager provender. He is a beloved treasure of the town, and especially valued when the affairs so often consummated in the leafy lanes of the park bring unwanted complications. Advises the laity on: Practical matters, the lovelorn, the casting off of passions. Weakness: Greatly craves any verbal description of food and drink. Reasoning that solitude is an even more meaningful devotion when practiced in the company of another, these two men - alias "Destra" and "Sinistra" - decided to join forces, sharing the same cavern two miles outside the metropolis of Fanguillia, but refusing to acknowledge each other's existence. They receive visitors in a glade, where they sit on opposite sides of the same stump. Their devotion is reinforced by the braiding together of their beards, which have reached a prodigious length. A small devotional industry has sprung up around the Two Hermits; pilgrims must pay 2 silver pieces in the chapel of St. Sylvain in the Fanguillia cathedral for an oak leaf badge for the journey, then a consulting fee of 5 silver on arrival, and a further fee of 2 silver to replace their oak leaf with the twig rood indicating successful pilgrimage. Furthermore, a great variety of refreshments, religious figurines, medallions, scapulars, unguents, lamps, candles and candelabra are on sale from a spacious shack outside their grove. Based on these proceeds, their forms avoid any suggestion of haggardness, and their garments, while plain, are never shabby. Advise the laity on: Visions suggesting what to do next, especially for those who feel they have missed something obvious, with a touch of homespun pragmatism (Destra) or tough love (Sinestra). Weakness: They have grown to hate each other and will not pass up the opportunity to make some pointed comment, which the other must pretend not to hear. The Duke of Santilena, having enclosed and ornamented a spacious pleasure garden with flora, wildlife, and picturesque ruins brought in from every corner of the Middle Sea, found lacking from this romantic idyll only a wise old hermit. Being more comfortable with the mystique of faith than its uncomfortable restrictions, he advertised around the town for a desperate young man of the laity who would be contracted to grow out beard and nails, dwell in a hut on the premises, and offer pithy aphorisms to visitors. The cleverest of the applicants, one Neppo, was hired on the spot and took the holy name Tithonus. This ornamental hermit, however, came to inhabit his role so seriously that he underwent a religious conversion. Subtly tinging his advice with barbed remarks about the Duke's dissolute ways, Tithonus eventually forced a confrontation, from which he emerged victorious. The Duke bequeathed the estate and duchy to Tithonus, and went on a penitent's pilgrimage to the Axis Mundi, from which he never returned. Tithonus now rules the Duchy in sobriety, chastity, and benevolence, although most of his day is spent in conference with bailiffs and administrators. He has hired the wastrel youngest son of a declining line as an ornamental Duke, to dwell in the palace, excite gossip, and in general furnish the bad example that Tithonus' sermons need. Advises the laity on: Matters requiring justice and discretion. Weakness: Is losing his connection to the Almighty with so much hustle and bustle around; feels the need to get away for a while. If low Intelligence means a visual or cognitive impairment, low Wisdom means an auditory one, or ... well, I've remarked before on how wacky a stat Wisdom is. Sanity? Willpower? Sensitivity? Percaption? The disadvantage approach can handle that though. It likes a multifarious attribute, for sure. I'm liking more and more, too, the idea that +1 Wisdom is the most bonus you can get at 13 up, but that 15, 16, 17 and 18 Wisdom give benefits. Seems this would be the perfect stat to hand out psionic abilities on. I think an Advantages series at this point is almost inevitable. Not for core 52 Pages, but maybe a supplement, or for the other, painfully inelegant and baroque d20 variant game I have in me. Oh yeah. 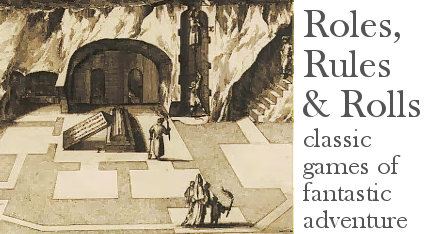 Courtney is tearing it up on Hack & Slash with two don't miss series: incredibly various and devious rumors about monster ecologies (so much better than "Science tells us that the roper lays a clucth of 2d6 eggs...") and OSR New Wave creator interviews. Check it out! This year, entrants are stretching the boundaries further, with many dungeons actually being complete mini-games, and gimmicks a-plenty. I'm even skipping over the couple dozen dungeons I wouldn't mind dropping into my campaign on the fly, and focusing on the ones that get a special piece of my attention and appreciation. The scenario is pretty simple - more a tactical challenge than anything else - but it's the toy factor that sells it. This one lets you cut out and assemble the adventure site as a handsome 3D cutaway model, complete with stand-up monsters. I have a soft spot for this one because it answers the pressing question posed years ago by Mr. Show ... Monster Parties: Fact or Fiction? Oh my god ... PUZZLES. To progress in the dungeon your players must solve a real Rubik's Cube. Gloriously over-the-top in its genre. Bringing 1980 back with a delirious Metal Hurlant science-fantasy setting, and a zine-press look. Wonderfully illustrated map and some great architectural concepts - sea plunder against the ticking clock of the tide. One of the best premises ever. A certain Ark got stranded on the top of a mountain and, trapped behind an angelic seal, the animals bred with each other and created a bizarre mutant menagerie. This one will either get Pat Robertson to convert to D&D, or make his head explode. Plain-looking but notable for its twist, which is the kind of thing you are allowed to pull only once in your career as a Game Master. Ever. An eye-catching cutaway illustration of an iconic piece of scenery with a small isometric dungeon below; it turns out the all-too-familiar idol has a preposterawesome secret. When the fantastic is commonplace, the mundane is exotic - but very different tones can flavor it. Jim McGarva offers a comical modern-day social adventure complete with its own system. Jason Morningstar gives an enigmatic art-adventure in which Great War veterans revisiting their old battlefield find tangible and intangible memories of the past, leaving unsaid what is real and what the nature of the challenge is. 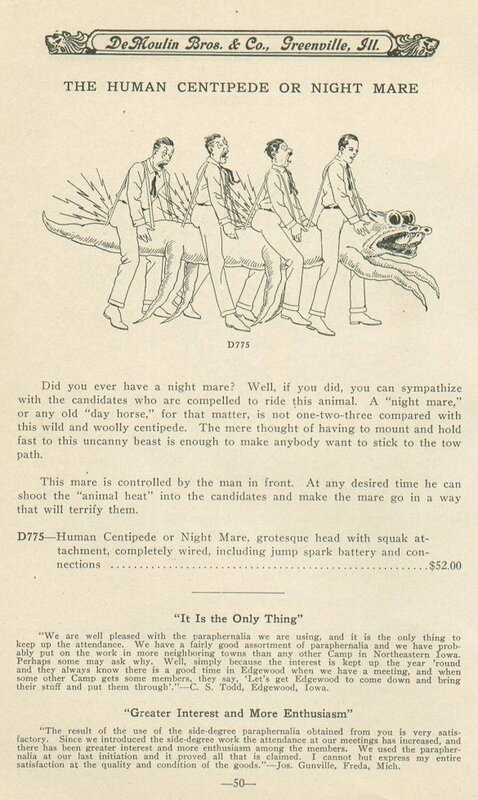 Just plain weird but strangely compelling. A giant with a magic staff can petrify and un-petrify people at will, and keeps them in cutaway rooms in the side of a mountain. Has the feel of a lost Cugel the Clever episode. The graphics are pretty basic but Joe Pruitt has hit one of my weaknesses - this one-page adventure is actually an epic fantasy wargame wherein the party must run around a hexmap, gathering allies to resist an invading army. Lo, a satire and/or celebration of gender roles. Graphically great and there's also some meat to the jokey encounters. An interesting, artistic presentation of a solo exploration adventure conducted mostly in the dark, with an abstract map and evocative sensory descriptions. What happened is the fairly usual scenario of evil critters up in the temple, but the graphic design is great, with an almost-isometric perspective and a use of silhouettes that doesn't feel schematic. Also with the nice graphics: LSF, A Stolen Spring; Nick Wedig, Kingfisher. Lots to chew on in this elegantly presented modern scenario, packing multiple plots and possibilities. Just wow. A choose your own adventure folding 8-page book that has you interacting with it by cutting off pieces, poking holes in the book, turning and flipping ... Probably the best outside-the box format of the contest. Function: Reveals invisible monsters and visual illusions in a 10 foot radius. Function: Reveals invisible monsters and visual illusions in a 10 foot radius. Also, biscuits. Pancakes. Don't breathe in the dust of appearance because it must get you high as nuts.